Surprisingly, I have loved packing for trips; and for me - that’s where the actual planning for the trip begins. Being the hyper-active person I have always been - I pack for almost all scenarios under the sun! For me, this bit of my trip is highly pleasurable because of the way I go about doing it - and almost always, my packing is done and dusted within a record time of 20 minutes. Step 01- Research and think ahead - This is the task I undertake while I’m not going to pack for another 9 hours, maybe when I’m commuting from work to home. Simply find out the current temperatures and weather conditions of the place that you are going to holiday at, and according to that - you will know whether to pack you woollens or your light clothes. Step 02 - Keep Toiletries pre-packed: Keep toiletries like a mini-tooth brush, tooth paste, hand towel, and other such items as deemed necessary by you packed in advance in a toiletries case. Believe it or not, this saves a lot of time. Step 03 - Pack according to number of days, not clothes: This is fairly simple and always works. 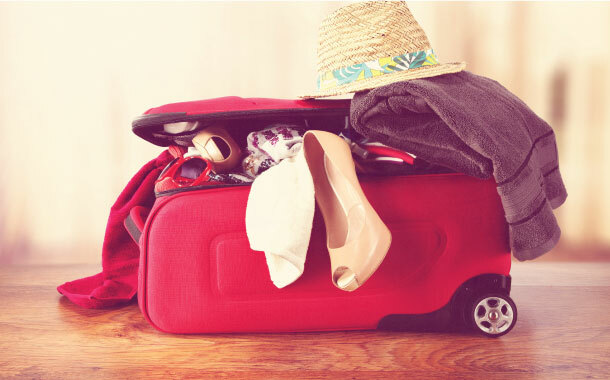 While packing, think of the number of days that you are scheduled to totally travel for (inclusive of your departure and arrival) and pack exactly those many number of clothes, and just throw in one or two extra tee-shirts. If it is going to be cold, pack woollens according to your body’s ability to withstand the temperatures. I normally go with two sweaters/jackets and one muffler/beanie. Step 04- Lay everything out in pairs: Right from underwear and inner wear to your tees and tops and pants, pair them up to the best combinations, and lay them on the bed. Once you’re satisfied that you have enough clothes to last you for your whole trip - pack it all in!